Once the soldering smoke has lifted, it is time to take a look at the software side and get the SPI communication up and running. Looking at section 4.3 of the data sheet, the serial interface has CPOL = 0 and CPHA = 0, corresponding to Mode 0 on Arduino. The most significant bit is sent first (MSBFIRST parameter). In order to talk to the chip, we need to make the slave select (NSS) pin low and then write an address byte with the most significant bit indicating read or write. If it is a write command, this is followed with one or more data bytes. You can write multiple consecutive registers, or in case you write to the FIFO buffer, write multiple message bytes. As a test, I wrote a very simple program that reads out some registers and prints the result on the serial port. It worked the first time I ran it, displaying the same initial values as found in the data sheet. So now we can assume that the hardware is hooked up correctly and I can start exploring the chip’s functionality! 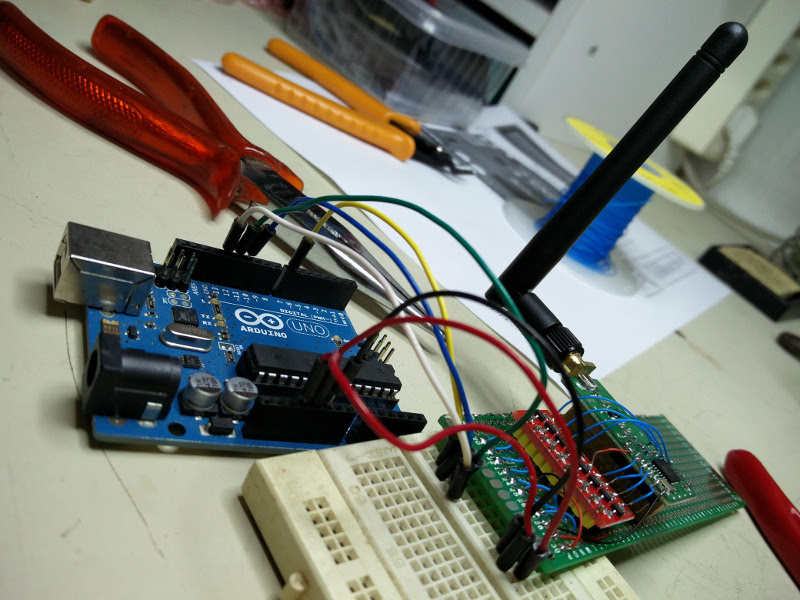 I created a github repository here: https://github.com/hansvi/sx1276-arduino-testing. The aforementioned sketch is called read-registers.